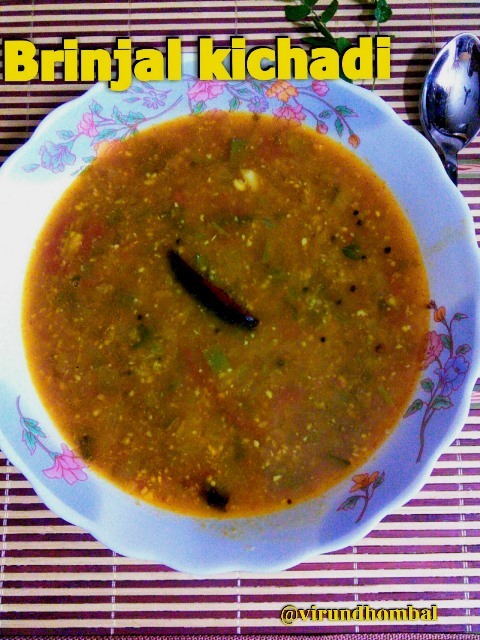 Brinjal(Eggplant)/Kathirikkai kichadi is a popular side dish in Tirunelveli served for idly or dosa. 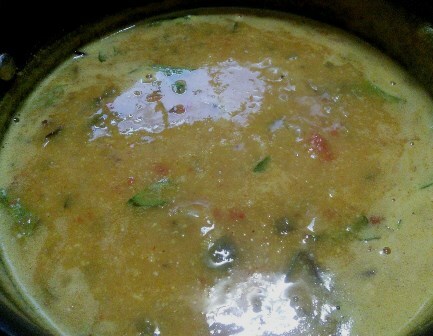 The white or green brinjals (thinner varieties) are more ideal for this kichadi. The small finger sized purple brinjals also taste good for this kichadi. We prepare this kichadi in two different ways such as kichadi with dal and without dal. 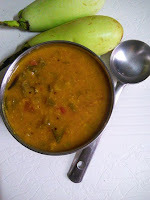 Now we are going to see Brinjal kichadi with moong dal. 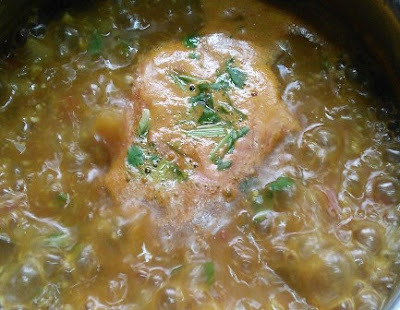 It is prepared by cooking the brinjals along with moong dal, tomatoes, green chillies, tamarind and onions. 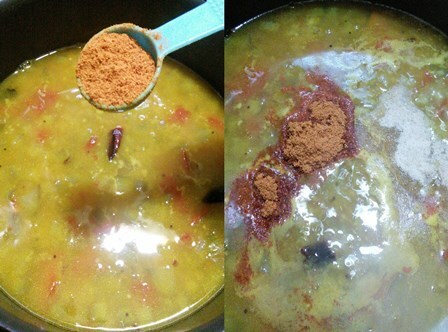 For flavours add a tsp of sambar powder and asafoetida powder. 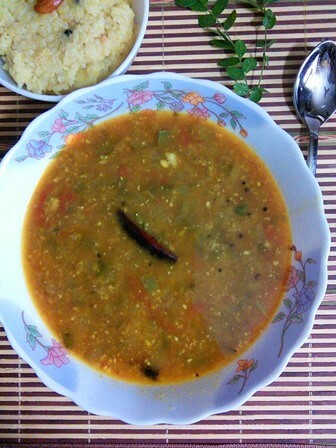 These type of kichadi or sambar are free from cholesterol, high in fibre and keeps you energized throughout the day. If you are eating a mix of vegetables, dals with carbohydrates for breakfast help in increasing energy level because they are digested slowly. So follow the simple instructions and prepare this healthy and easy Brinjal kichadi for your next breakfast. If you do not have brinjals, you can replace it with finely chopped ridge gourd. Brinjal(Eggplant)/Kathirikkai kichadi is a popular side dish in Tirunelveli served for idly or dosa. Chop the brinjals, tomatoes and onions finely. Slit the green chillies. Soak the tamarind in hot water. Extract the juice with 1 cup of water. Take a small pressure cooker and add the chopped brinjals, tomatoes and green chillies. Add the moong dal and water. Close it with the lid and pressure cook for 5 to 6 whistles. While the brinjals cook, grind the coconut and fried grams smoothly. Add 2 tbsp oil to the kadai. Heat for about 2 minutes and add the mustard and urid dal. Allow them to crackle and add the red chillies and chopped onions. Reduce the heat a little and saute the onions well. Now add the tamarind extract, turmeric powder and required salt. 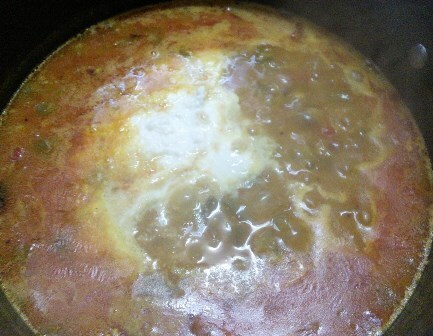 Add the sambar powder, asafoetida powder and allow it to boil for 5 minutes. Add the cooked brinjals mixture to the tamarind extract. Mix them well. Next, add the ground coconut paste and water. Simmer for 10 minutes and add the curry leaves and coriander leaves. The consistency for kichadi should be thinner than sambar. 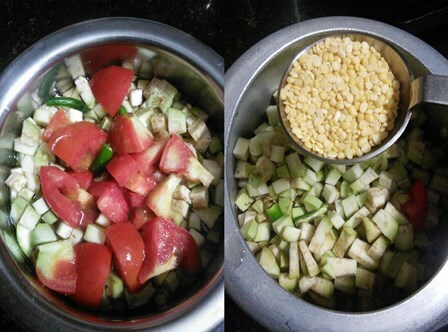 Chop the brinjals, tomatoes and onions finely. Slit the green chillies. 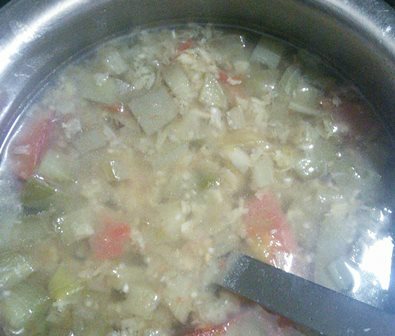 Add the chopped brinjals, tomatoes and green chillies in a bowl full of water to avoid discoloration. Take a small pressure cooker and add the chopped brinjals, tomatoes and green chillies. Add the moong dal and water. Close it with the lid and pressure cook for 5 to 6 whistles. 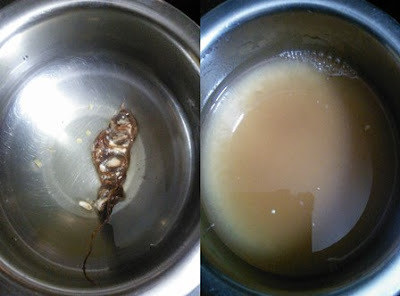 Soak the tamarind in hot water for 10 minutes. Extract the juice with 1 cup of water. If you are using tamarind paste, dissolve 2 tsp paste in 1 cup of water. 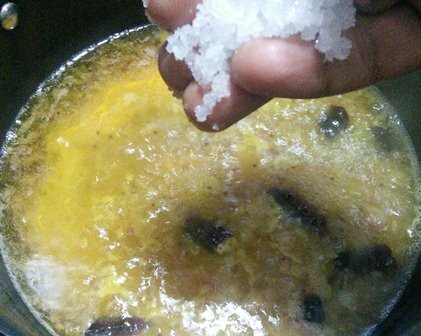 While the brinjals cook, grind the coconut and fried grams smoothly. (Do not add more fried grams because it will change the taste and the consistency). Add 2 tbsp oil to the kadai. Heat for about 2 minutes and add the mustard and urid dal. Allow them to crackle and add the red chillies and chopped onions. Reduce the heat a little and saute the onions well. (I have used coconut oil, so white foamy oil is appearing). Open the cooker and gently mash the brinjals with a ladle. Now add the tamarind extract, turmeric powder and required salt. Add the sambar powder and asafoetida powder. Allow it to boil for 5 minutes. 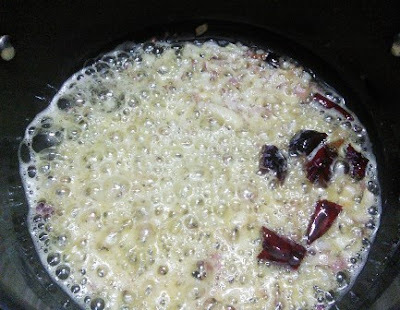 Add the cooked brinjals mixture to the tamarind extract. Mix them well. 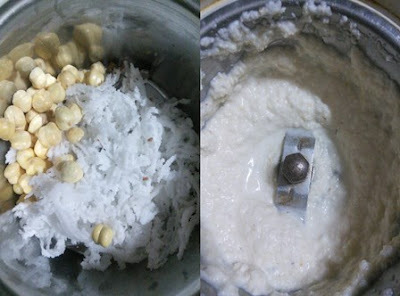 Next, add the ground coconut paste and water. Simmer for 10 minutes and add the curry leaves. When you get a nice aroma from the kichadi or a nice boil add coriander leaves. The consistency for kichadi should be thinner than sambar. Serve it hot with idly, dosa or pongal.